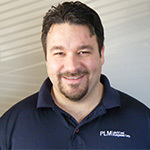 Andy Tomaszewski, PLM’s Southern Lakes Manager began his career with PLM in 2001 after graduating from the University of Michigan with a Bachelor’s Degree in Ecology. While studying at the U of M biological station on Douglass Lake near Pelleston, Michigan Andy began to focus his career in aquatics. With over a decade of experience in aquatic plant management and setting up lake management programs through special assessment districts, lake associations, and residents, Andy has worked on numerous evaluation treatments. His latest project included working with the use of Sonar A.S. and determining the best bump up protocol for it’s use in Michigan waters. Andy has expanded his Southern Division from the northern Kalamazoo area to the border of Michigan and from Jackson to the lakeshore, working directly with his lakes in balancing ecological decisions with residential concerns. Andy is devoted to his family and two boys and is an avid sportsman.